The Jackson 5: Live At The Forum is a new 2-CD set released June 22 that uncovers an amazing chapter from the phenomenal career of Michael Jackson and his brothers in the J5: their extraordinary performances from the Los Angeles Forum, recorded in June 1970 and August 1972--the first at the start of their rapid ascent to stardom, the second when they became established icons. These brilliant shows have not been released in any form until now, the 40th anniversary of the 1970 show. Live At The Forum features earth-shaking live performances of the group's best-known hits - "I Want You Back," "ABC," "The Love You Save," "I'll Be There," "Never Can Say Goodbye" and more. Single B-sides "I Found That Girl" and "I'm So Happy" and such surprises as album cuts "Bridge Over Troubled Water" and "Zip A Dee Do Dah," plus songs not released by the J5, including covers of James Brown's "There Was a Time" and the Isley Brothers' "It's Your Thing," are part of the shows. The 1972 show also features a full, fantastic set of Michael's solo hits, including "Got To Be There" and "Ben," his brand new single at the time, as well as a solo spot by Jermaine. Disc 1 includes the Forum show recorded June 20, 1970, when the group broke existing box office records at the venue. The J5 were on their first national tour, and the show is a unique document of the growing "Jacksonmania" gripping the globe. Disc 2 is the complete show from August 26, 1972, just three days before Michael's 14th birthday. Each disc includes a bonus track: an unreleased full live version of "Mama's Pearl," from the concert that became part of the 1971 TV special Goin' Back To Indiana, closes Disc 1; "I Wanna Be Where You Are," from the soundtrack album to Save The Children, makes its CD debut at the end of Disc 2. 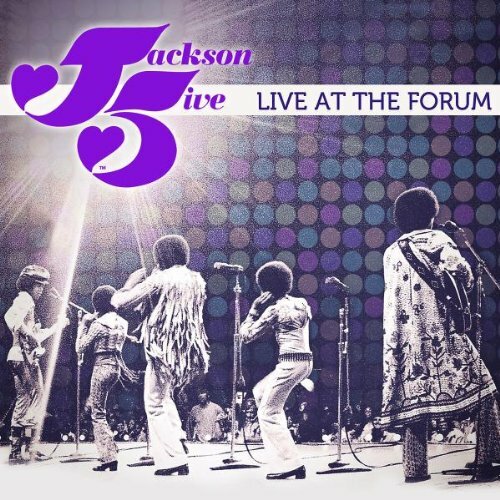 Live At The Forum is housed in a collector's digi-pak with rare photos, collectable postcards of each Jackson brother and insightful liner notes by Mark Anthony Neal. If you have any questions about this product by Jackson 5, The, contact us by completing and submitting the form below. If you are looking for a specif part number, please include it with your message.